Sentient Developments: What is a person? I think perhaps the most important thing to keep in mind while discussing 'personhood' is that there is no fact of the matter as to whether or not something is a person, since 'people' are not part of the 'furniture' of the universe. Any delimitation of 'personhood' must, by the concept's nature, be provisional, and can only be defined in relation to the larger culture. To illustrate: I can't see as how Homeric man, had he any interest in the question of personhood, would include 'self-awareness' or 'self-control' on the list of essential attributes of personhood. What use would a man whose destiny was bound up with the whims of the gods have for these things? If anything, they might be seen as a privation rather than an attribute. Any visceral reaction one might have which cries out 'The line must be drawn here!' on the question of personhood is as ungrounded as the reactions of disgust anti-abolitionists had toward emancipation. So then how can we properly address the problem of personhood? Questions of 'personhood' can only be undertaken with an eye to the larger questions: 'What kind of civilization is most desirable?'. And that question must be informed by a continuous dialogue between what are, for now, called persons, and what are, for now, called non-persons. Excellent. 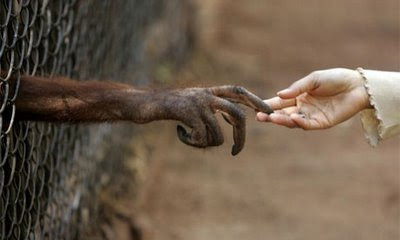 I once had the opportunity to hear Jane Goodall speak; I suspect she'd be in your corner on this. I know some humans who don't meet those fifteen criteria. Good that someone took a stab at a list, though something like the DSM IV model (if you have 8 out of the following 15, or such) might work. There are plenty of times when I lose sense of self and time during meditation, or illness. People change, and then change again, so I'd really like to be grandfathered in once I initially qualify for personhood:) It would be unfortunate to lose my rights, and be carried away during sleep or other changeable moment. Of course, I'm goofing on this now, but the topic certainly invites creative thought. It's worth going back to school for this, better yet, just write on this, George! Fascinating. Thanks for bringing it up. We apes who visit your site regularly are ready to help out. Jayar what about Homo Sapiens do I need a culture to set a boundary on that? As noted by George this and other criteria of personhood often miss many humans that aren’t technically persons. Some accounts consider sleeping persons non persons or even babies. If you then slide to sentience you open the book to other non person sentient species. Which I think George wouldn’t mind. A conscious individual who initiates force, threat or coercion against one of s/his own species is an immoral member of that conscious species. Put another way, default to brute force belittles a conscious being's 'civilization', wherein such behavior is an offense to every member's valid expectation of what ought to be considered a valid action of a conscious being whose primary survival tool is consciousness, which needs not initiate immorality in order to survive/thrive ~ else it is de-facto not a civilization. In terms of non-humans, when a beast initiates such behavior, it is generally considered to be an amoral act by a non-conscious member of Earth's natural kingdom. In other words, the rules of 'civil' behavior do not apply to that species, and it is ascribed allowances (by we conscious beings) in order for it to be enabled to survive and thrive. George, are you actually ascribing morality to non-conscious members of Earth's animal kingdom (ie, members of species whose primary survival tool is not consciousness), or is it possible you are merely reducing 'personhood' to a level where morality is superfluous?